Bundesliga | Serge Gnabry: The Natural Heir to Thomas Müller at Bayern Munich? Serge Gnabry: The Natural Heir to Thomas Müller at Bayern Munich? "Eden Hazard is a world class player, [his ability] is madness" says recent Bayern Munich signing Serge Gnabry when pushed on his footballing role models. "The way he shields the ball and runs with it is incredible." Click here for an overview of all the Bundesliga summer transfers! "I also regularly watch videos of Franck Ribery on YouTube. He dribbles into what look like hopeless corners yet still always manages to find a way out." High praise for his new Bayern teammate and Borussia Mönchengladbach star Thorgan's elder brother, but surprising, perhaps, when you consider that Gnabry plundered a goal every 97 minutes for Werder Bremen in the season just gone; scored six in six games as Germany won Olympic silver last summer, and fired home a hat-trick on his senior Germany debut - very much the numbers of a striker. 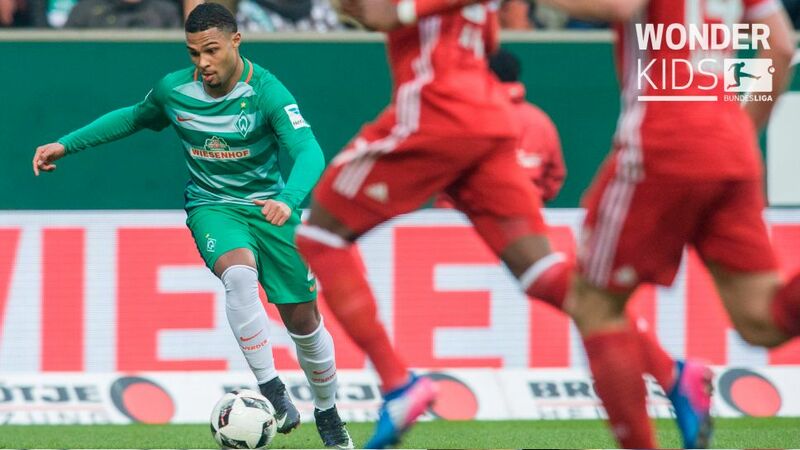 "My father said I should step back into the playmaking role, because if there was nobody to provide assists I wouldn't score anymore," explained Gnabry when bundesliga.com met the talented 21-year-old in February following his TagHeuer Bundesliga Rookie of the Month nomination. "I have no idea how this rumour came into the world," laughs Gnabry. "You could say: 'OK, let's give him this honour', but it's just wrong - he wasn't even a professional footballer!" "Playmaker" may not be the most apt description of Gnabry junior, either: he only assisted once in his maiden Bundesliga season, laying on Lennart Thy for the equaliser in what proved to be a thrilling 2-1 win over Wolfsburg last September. That's not to say that Gnabry hasn't come on leaps and bounds since his ultimately frustrating foray into English football, which ended with his 2016 switch to the Weser Stadium after just 11 appearances in the English Premier League - 10 with Arsenal and one on loan at West Bromwich Albion. Gnabry's shift deeper saw a huge upswing in productivity. Having more of the game in front of him meant he was able to spot spaces before those meant to be marking him, and his incredible ability to hit 34.7 km/h in full flight helped him score in his first five away games in Germany - breaking a Bundesliga record that had stood since 1995. Watch: Gnabry's Top 5 Bundesliga goals! "For three or four years I was able to work with [Arsene Wenger] and the first team," says Gnabry of his formative years in North London. "I learned an incredible amount. At Arsenal it's amazing for attacking players because you have so much possession." Gnabry, though, was not prepared to trade on his natural athleticism and impressive early footballing CV. Of his penchant for yoga he says: "In the past, only hippies did it. But it's a good way to relax the body. It brings me something extra." Now a European Under-21 champion, Gnabry has proven as malleable as his pastime of choice, playing across the final third in his career to date.